“Are you an evangelical?” “Is your church an evangelical church?” If they are asked, the majority of Korean pastors would say yes to both questions. Regardless of which denomination they belong to, they would acknowledge that evangelicalism expresses their identity and understanding of Christian beliefs and practices in the local church and in various other life settings. From the outset, Korean Protestant churches were strongly influenced by evangelical missionaries from North America. These missionaries from Presbyterian or Methodist denominations used the word evangelical in naming the ecumenical council they organized in 1912 (“Federal Council of Protestant Evangelical Missions in Korea”). The evangelical identity of the Korean church was shaped and strengthened over decades, and the terms evangelical and evangelicalism have a range of meanings in the Korean context just as in the American one. Korean evangelicals share convictions about the absolute authority of the Bible, commitment to the Reformed tradition, and strong passion for evangelism. Current Korean evangelicals and evangelical churches are facing challenges. Churches are increasingly irrelevant to young people. The gospel of the kingdom of God is often replaced with the prosperity gospel, intended to please itching ears. Some pastors lacking in theological discernment are quick to embrace things that are contradictory to the gospel for the sake of church growth, and congregants are vulnerable to their heretical teachings. Churches are losing credibility among those outside the church because of the moral and ethical missteps of pastoral leaders. Careless talk from pastors and Christian leaders in the public square make churches appear to be irrational, selfish, rude, aggressive, exclusivistic interest groups. There are a considerable number of Christians who, out of frustration, decide not to attend any church, even though they profess the Christian faith. These are often called “Gha-nah-ahn members” (who may be compared to unchurched people). Korean evangelicals will need to figure out how to meet these challenges that may lead Korean evangelical churches toward catastrophic failure. Some Christian leaders are skeptical of this possibility, but crisis can open a window of opportunity. There are a growing number of young evangelical pastors, Christian intellectuals, and emerging Christian leaders who dream a new dream for Korean evangelicalism. In his recent book A Paradigm Shift in Korean Churches (Holy Wave Plus Press, 2011 [in Korean]), Fuller faculty colleague Professor Hak Joon Lee strongly urges Korean Christians to venture toward a new paradigm of church and ministry emphasizing public spirituality. His message is well received by young evangelicals and emerging Christian leaders. A few years ago a group of evangelical pastors formed the Korean Evangelical Church Alliance, emphasizing the recovery of the holistic gospel of the kingdom of God in order to reclaim the credibility of the Korean church and particularly of Korean evangelical churches. They try to build church communities on a holistic understanding of the kingdom of God. They teach church members to live as faithful followers of Jesus Christ not just in private life but in public spheres. They collaborate with other reform groups such as Protest 2002 to further the Korean church renewal movements. There are other organizations as well that attempt to foster theological discernment and critical reasoning among young evangelicals. For example, Chungeoram Academy convenes conferences and seminars on various topics so that young evangelicals can rethink and reshape their evangelical identity (for more, visit www.ichungeoram.com). Fuller is known to Korean pastors and evangelical churches as the largest evangelical seminary in North America. Korean students come to Fuller to be trained with an open evangelicalism that holds true to orthodoxy, engages culture innovatively, and furthers the gospel by seeking to embody God’s rule in every area of life. This is how Fuller and Korean evangelicals can think and work together to help Korean evangelicals meet the contemporary challenges of our time. 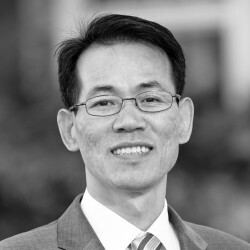 Jin Ki Hwang joined the Fuller faculty in 2010 as assistant professor of New Testament for the School of Theology’s Korean Doctor of Ministry (KDMin) program and became assistant dean in 2011.